It's my second mother's day, and I'm so excited! Last year Jesse woke up early and made me a huge feast for breakfast (see the post here). The year before that we still celebrated because I was pregnant, and I bought myself this bag (because I needed an excuse). Ha! This year, I treated myself to some goodies (some of which are in this guide). Jesse got the day off work, too, so I'm excited to be able to spend the entire day together as a family. My husband picked this one, and I loved the color of this dress, it will transition perfectly from summer to fall. It's so comfy, and I love that I can just throw it on without much thought for accessorizing. The color and fabric is perfection, and the back detail is just the cherry on top. I'm constantly on the hunt for shirts that are nursing friendly, and I definitely scored with this one! 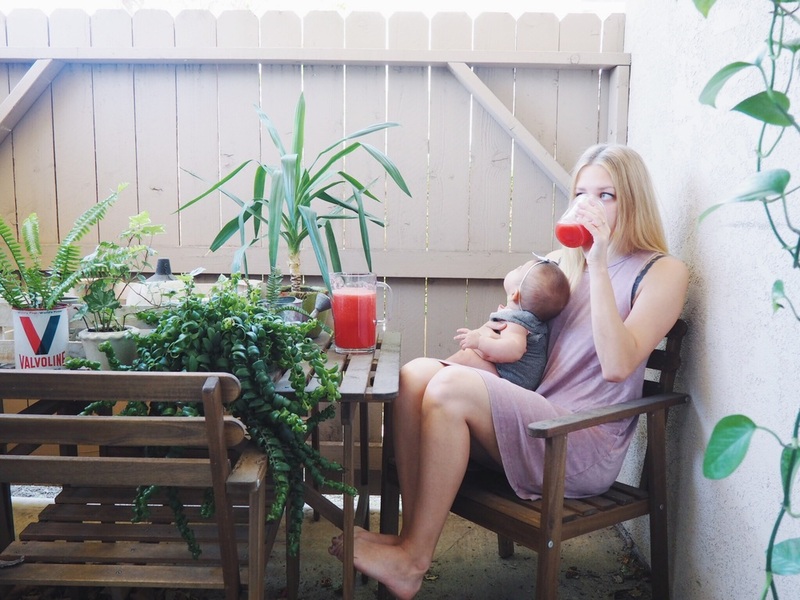 Minted Em Boutique is the cutest little online boutique with a ton of options for a nursing mama, and at an amazing price! This top is the Oatmeal Babydoll. The fabric is so light and flowy I feel like I could fly, but also lay down and sleep because it's so comfortable. The fit is obviously loose, but not frumpy looking, the way it lays is very flattering. And I'm even thinking, "maternity shirt for baby #2??" Laughing because she literally almost spit up into my mouth. But I dodged it. And, of course, I can't have a post without the spotlight on Ever at some point 💁🏼. So, here she is. Minted Em is offering my readers 20% off with code MORGANFAITH until Sunday April 24th at midnight! Same outfit, different day. Duh. First of all, my outfit is from Blanqi. 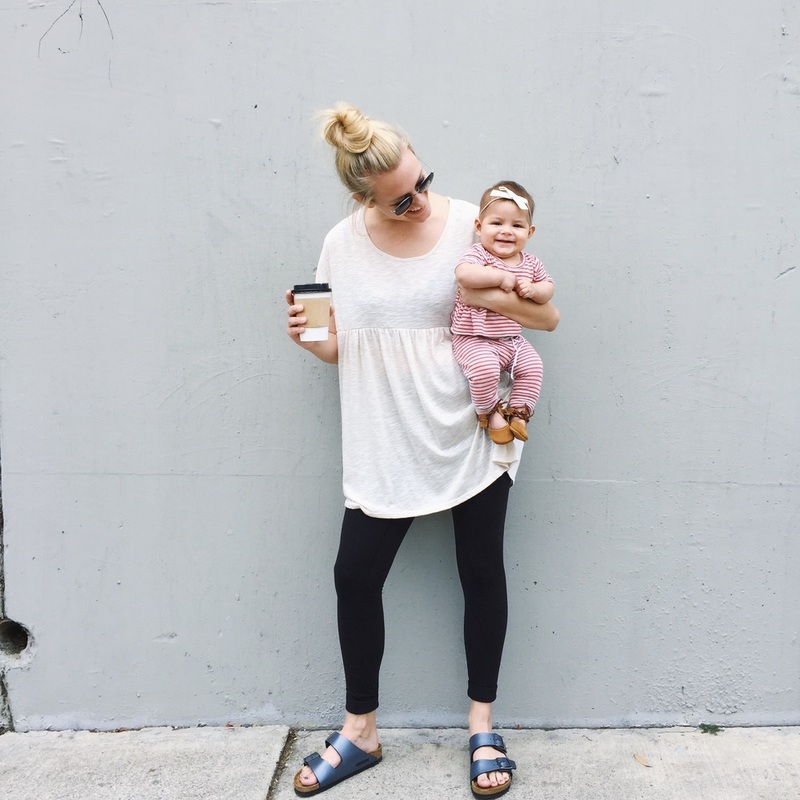 They have the best maternity and post partum leggings and tees around. AND if you click here you can get 20% off your order (praise hands emoji)! Recently, I've been utilizing Ever's nap time and the millions of bounces I have to do to rock her to sleep, to get a mini workout in. No, it's not going to burn a thousand calories, but it will definitely build some muscle. Try it! In a second position (heels in, toes out, legs wide), I plié (lower down) and lift. That usually doesn't put her to sleep, so I pulse it down. These tiny pulses trigger the small muscle fibers in your quadriceps, giving a long lean look instead of a bulky. I also pulse and rock at the same time. Staying in a low plie, pulse to the left straightening the right leg, and then pulse to the right straightening the left leg. Repeat. Most of the time, she falls asleep after this one, but sometimes I move on to some different moves because my thighs can't handle it anymore. Like, calf raises in first position (heels together, toes out), parallel (feet parallel, hip distance), and toes in heels out. I'll also try out some lunges. Lunge and lift. Then pulse it down in a lunge. If she's still not asleep at this point, I go back to my plie pulses and rocks in second position (which you can also do in first position, but second has a greater range of motion).